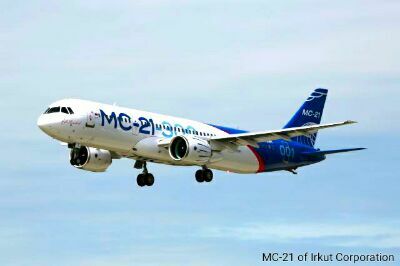 MC-21 is a Russian made passenger jet aircraft that is being developed by Irkut Corporation. The aircraft is expected to replace old Soviet planes such as the Tu-154, Il-62, Tu-204 that cannot compete against Airbus 320 and Boeing 737 series. These western made aircrafts have got more modern equipment. They are also lighter and more fuel efficient. To match Western aircrafts, Russian engineers implement a lot of innovations in their new plane. For them, MC-21 is a serious project. It features supercritical aerofoils wings that are made of composite fibers. It is lighter, strong and cheaper to manufacture. The MC-21 airplane will be driven by the American Pratt and Whitney PW1400G jet engine whose by pass ratio is 12:1. The turbofan engine spends 15% less fuel compared to CFM56 that has been used in a lot of Airbus A320 and Boeing 737 series. The Russian government has financially supported the development of PD-14 engine manufactured by Aviadvigatel. This domestic engine has got 8.5:1 by pass ratio that is significantly higher than the 5.5:1 by pass ratio of CFM56 manufactured jointly by Safran and GE under a joint venture company CFM International. The market for single aisle narrow body airplanes is still dominated by the duopoly of Airbus and Boeing. For smaller regional jet planes, the competition is even tougher with more international players such as Sukhoi, Bombardier, and Embraer. In addition to MC-21, another modern aircraft from Russia that has been operating in several countries around the world is Sukhoi Superjet 100. It is developed and manufactured by Russia's Sukhoi airplane manufacturer in cooperation with Safran. Russia is working hard to revive its aviation industry that collapsed after the disolution of Soviet Union.